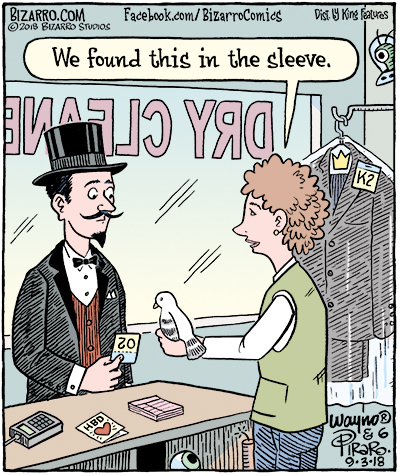 Bizarro is brought to you today by Happiness. The above cartoon is blatantly political of course, but I will resist commenting on it as doing so would invariably fall into one of two categories: preaching to the choir or falling on deaf ears. So instead, let's talk about a fun thing that Olive Oyl, my daughters (the K2) and I did last week on Instagram! 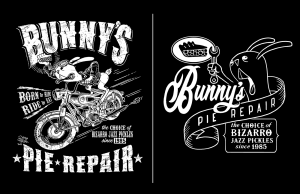 For some time, Jazz Pickles have been asking me to do a Bunny's Pie Repair T-shirt and I've finally relented. I came up with two designs and couldn't decide which I liked better. So, since ours is truly a family-run business (just me, my daughters [Krapuzar and Krelspeth] and my nearwife, Olive Oyl) I decided to ask the gals what they thought. And, as they often do, they suggested we decide the issue with a public contest. We then posted both designs on my @danpiraro page on Instagram and asked people to vote. They did, and the final tally was a statistical dead heat so we decided to turn both designs into shirts! Another victory for consumer choice! Later that day, his barber found rabbit droppings in his hair and his wife found half a woman in a box in the garage. Oh, the disgusting personal life of magicians. I’ve had plenty of impure thoughts in my life but they were never dressed like these two. Quick true story: When I was in junior high school in the late 60s, my school principal called me into his office to tell me that he had ordered a book on Picasso to give to me since I was a talented artist. 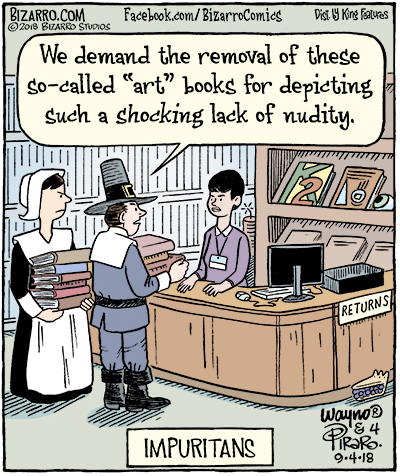 As he flipped through the book and showed me various pages, he explained that he regretted that he could not give the book to me because there were so many paintings and drawings of naked people, "...like this. And this one. And here's another." I thanked him and left without the book. He was a very nice guy but in the end, I think I prefer impuritans. 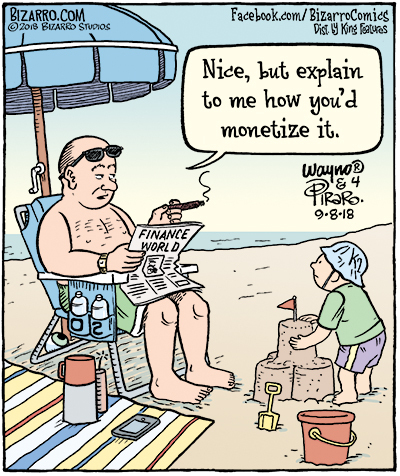 For more fascinating backstory and some other fun things Wayno does on his site, don't miss his weekly blog where he talks about these same cartoons! The URL is at the end of this post. 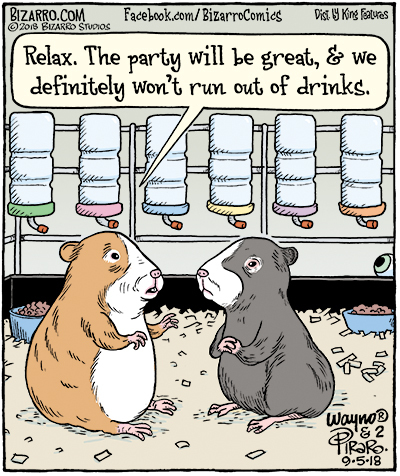 If you’ve ever been on a charter flight with a large group of party peeps, you know how these folks feel. Personally, I think there are few things more annoying than the happiness of others when I'm not sharing in it. Especially if they tend toward extroversion. Order the street bagel—it’s been marinating in the gutter for days. 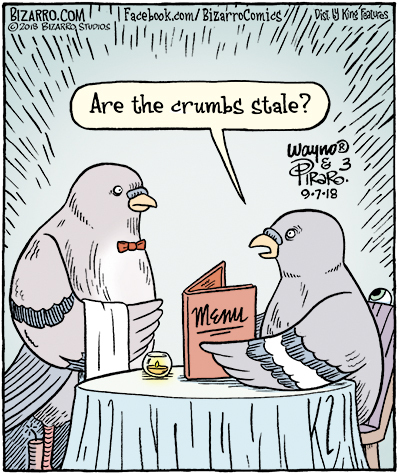 On a related note, how do birds keep those tiny bowties in place? On another related note, I've never noticed before how much pigeon's legs look like dynamite. 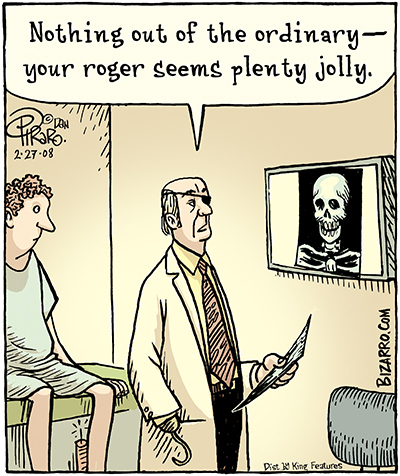 That's the lowdown from Rancho Bizarro this week, Jazz Pickles. If you're near Tulsa, Oklahoma next week and want to meet me in person and hear me do stand-up comedy, please click on this and buy some tickets. The money will go to some awesome charities! Also, please click on some of our links below, which help us to keep the campfires burning at Rancho Bizarro. Thanks!